This Dec. 2, 2016, view from the Navigation Camera on the mast of NASA's Mars rover Curiosity shows rocky ground within view while the rover was working at an intended drilling site called "Precipice" on lower Mount Sharp. NASA's Curiosity Mars rover has stopped driving and using its 7-foot-long (2.1 meters) arm while mission controllers investigate a problem with the robot’s sample-collecting drill. Curiosity was supposed to begin its seventh drilling operation of 2016 last week. But team members learned on Thursday (Dec. 1) that the car-size rover detected a problem with its "drill feed mechanism" — which pushes the drill outward from a turret at the end of Curiosity's arm — and failed to complete the command. "To be cautious, until we run the tests on Curiosity, we want to restrict any dynamic changes that could affect the diagnosis," Lee added. "That means not moving the arm and not driving, which could shake it." Curiosity is not in a precautionary "safe mode," however. The rover continues to study its surroundings on the lower slopes of the 3.4-mile-high (5.5 kilometers) Mount Sharp using the cameras and spectrometer on its head-like "mast," as well as its weather-station gear, which is attached to the mast and Curiosity's body, NASA officials said. Meanwhile, the rover team is trying to figure out what caused the drill issue. "Two among the set of possible causes being assessed are that a brake on the drill feed mechanism did not disengage fully, or that an electronic encoder for the mechanism's motor did not function as expected," NASA officials wrote in the same statement. It may be possible to work around either of these issues, Lee said. "We still have percussion available, but we would like to be cautious and use it for targets where we really need it, and otherwise use rotary-only where that can give us a sample," said Curiosity project scientist Ashwin Vasavada, also of JPL. The $2.5 billion Curiosity mission touched down inside Mars' Gale Crater in August 2012, tasked with determining whether or not the area could ever have supported microbial life. The rover quickly found plenty of evidence in the affirmative, determining from drilled samples that Gale hosted a long-lasting lake-and-stream system in the ancient past. 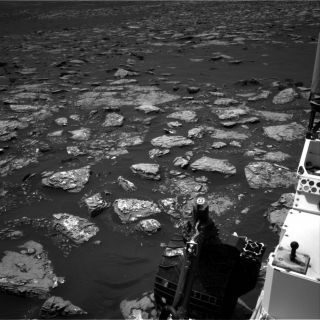 Curiosity is now climbing up through the foothills of Mount Sharp, which lies in Gale's center. The six-wheeled robot is searching for clues about how, why and when Mars transitioned from a relatively warm and wet world long ago to the cold, dry planet it is today. To date, Curiosity has driven 9.33 miles (15.01 km) on Mars, gained 541 feet (165 m) in elevation and drilled into 15 rocks, NASA officials said.